Any connoisseur of golf will appreciate this new collection of poems from Oliver Comins. It is an insightful and refreshing journey played out as a round of golf on his local course. Highly inventive and unusual, the book contains the different stages of this journey from “Locker Rooms” to “Nineteenth Hole” and the main focus of this collection is 18 poems about each hole he encounters. Anyone not interested in golf might expect the book to be dull: but they should be encouraged to read it for the sake of the poet’s effective and evocative use of language to describe the surroundings, the history of the course and the particular challenges presented by each hole. Comins uses a fluid style of writing and easily accessible language to achieve a level of engagement with any reader and help them navigate the ups and downs of a round of golf. An endearing feature of any sport – especially golf – is that it is almost a reflection of life in that all the emotions one experiences in a lifetime are compacted into four hours of play: hope; despair; frustration; joy and pleasure. Comins clearly illustrates this. The scene is set in the first poem “Locker Rooms” which are aptly described as “snug”, “A labyrinth of sorts” with “Spick flowers in vases and a span of towels / in a neat pile by the shower door.” The staff are friendly and “No-one is made to feel / unwelcome, even those who are interlopers.” Nevertheless, the author has opted to “change in a packed car park” before he sprints to the first tee. so early in the round and so completely. to see an effortless ball follow the exact line chosen. This trajectory of emotion continues throughout the collection: failure one minute and then satisfying success the next. Through his honest, clear and simple style and choice of language, Comins skilfully conveys the nature of the game to the reader. as you realised what was happening and how quickly. with piles of handmade basket and carved trinkets. Also “a man with a tenor saxophone” joins the ladies and his music “can turn out to be, an unexpected source of consolation /as their rounds peter out,”. Other notable poems include: “Half Way House” about a place to rest and grab a bite to eat before the next nine holes; “Nineteenth Hole (Not Much)” about chatting in the clubhouse bar after the round; “Breakfast at Turnberry” a homage to Tom Watson’s performance at The Open in 2009 and finally the last poem of the collection (and undoubtedly the most poignant) “Rose Bed, Wisteria and Apple Trees” which concerns the author’s fond memories of an elderly neighbour, who introduced him to the golf at the age of ten. with all the florid oaths of golfing despair. 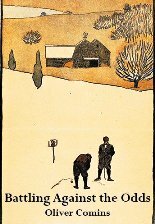 This is an enchanting picture and it adds a further dimension to the author’s portrayal of golf. Furthermore images like “skylarks clattering above you on a summer afternoon”, “diffusing sea air that billows or gusts intermittently”, “morning sun is barely seeping through opaque air”, “the country’s sultry summer murmuring” and “high wisps of cloud / are indifferent to your fate”, all produce a subtle “Romantic” sense which I found extremely attractive. In conclusion, Battling Against the Odds brings to life the world of golf but does so without sacrificing literary merit. Comins appeals to the reader’s senses and emotions with his “Romantic” descriptions of the course and his honest appraisal of the ups and downs of the game – all in an easy and accessible style of poetry. This book might not change the world but it will certainly entertain golfers and might encourage others to take up the game.